7BitArcade began life back in August 2011. This UK culture magazine and blog was where interested readers could find out about music, TV, film, games, and even politics. The magazine and blog was so many things to so many over the years but they threw in the towel in September 2015. 7BitArcade wanted to be a part of the way we all integrate with an art form through words and shared experiences and they did just that for just over four years. Their mission was to work and play with those who love music as they did, and those who wanted to be a part of the good times they were continuing to have. In 2015 7BitArcade won the Essex Digital Sports/Entertainment Bronze award. A one stage during the life of this cultural magazine, there were over 20 writers, regular reviews, event coverage, and original content. By the time of their demise they were lucky to have a couple of articles on their website each week. In the beginning a lot of the writers at this online magazine were students who were getting in some experience before finding their place in the world. Writers were not paid and the site wasn't making a profit. Most of the writers finished their education and moved on. As writers moved on to pastures new there was less time to review albums, go to shows, or come up with original feature articles for the site. 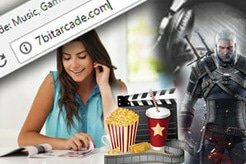 7BitArcade was around for four years and initially it focused on being a gaming orientated site. It ended up being an entirely music focused site and experimenting in other fields too. Some amazing sessions were filmed including Owls, Johnny Foreigner, Dingus, acoustic sessions, filming at festivals, the Human Pyramids sessions, and more. Prior to focusing solely on music, 7BitArcade used to feature articles on gaming. Some of these were opinion pieces that were very in-depth and included titles such as, How Tony Hawks Shaped my Music Taste, Online - A Journey into cloud gaming, Single Player Only: When is Multiplayer Unnecessary? 7Bit Arcade cultural magazine has been missed and the founders got to have some amazing journeys over their four years and there were lots of writers who gained vast experience writing for the music and gaming industry. The original team may be gone but there is still life after 7BitArcade. What are all the cool kids doing?